Four exquisite teas chosen by connoisseurs, each one a different sensory delight--and healthy, too. A hired connoisseur to visit Japanese tea plantations and bring back the best pluckings for you to sample? The very thought will send tea lovers into a lovely, Zen daydream. 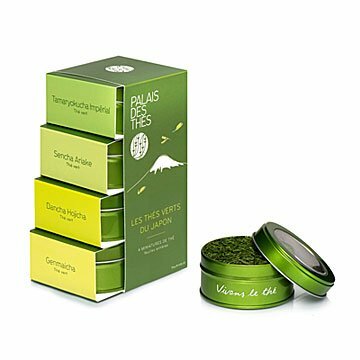 Make it come true with this set of four highest-quality green teas, chosen by experts who have longtime relationships with small Japanese tea estates. Japan only exports 5% of its green tea—that's how good it is. Packed with vitamins and antioxidants, it's one of the rare health foods that's a delight to the senses. This set is an ideal introduction to Japanese teas or a gift for connoisseurs of refined green teas. Tamaryokucha Imperial: Milder than most Japanese green teas, it's beautifully smooth. The dark green liquor is silky, subtle, and a little sweet, with a highly fragrant infusion. Sencha Ariake: Produced in the province of Kyushu, Sencha Ariake is the mildest of the great Sencha teas. Sweet, invigorating, and flowery, it's lovely to wake up to in the morning. Bancha Hojicha: Produced in the Shizuoka district, it's roasted in porcelain pots, giving it a reddish-brown color and a nutty, earthy, toasty taste with delicious woody notes, with almost no bitterness. Low in caffeine, it's excellent with meals, and refreshingly thirst-quenching any time of day or evening. Genmaicha: This blend of Bancha and roasted brown rice is unique in the world, with a blend of grassy and nutty flavors and a yellow-green liquor. Its low caffeine content make it an ideal after-dinner tea and refreshing palate-cleanser. Loose leaf, according to husband it's pretty good quality and thoroughly enjoyed it. It's used often. My father-in-law drinks tea every day. Such a good gift set. And there's a lot of tea per container even though it's a sampler set. So good in fact, I kept it for myself!